Climate change is a global problem that demands a global response. Recognizing this, the Sabin Center provides legal support for and participates in international efforts to address the causes and effects of climate change. We also track how foreign jurisdictions are addressing climate change through legal reforms and litigation. negotiation of international agreements to address climate change. The Sabin Center and the Grantham Research Institute on Climate Change and the Environment are in the process of consolidating their collections of the laws, regulations, policy statements, and other directives issued by national governments. The non-U.S. climate litigation chart is an online database of cases from foreign jurisdictions that involve issues related to climate change mitigation and adaptation. Our U.S. climate litigation chart can be accessed here. The Sabin Center sends representatives to the UNFCCC Conferences of the Parties to provide assistance to negotiators and to participate in civil society events. We also collaborate with the Legal Response Initiative to provide assistance to least developed countries during the UNFCCC negotiations. The Sabin Center worked with the UN Development Programme and the International Federation of the Red Cross (IFRC) to advise the Laotian government on the development of an integrated disaster management and climate change adaptation law. Executive Director Michael Burger’s commentary on the project is available on our blog. See also: Presentation, Integrating Disaster Risk Management and Climate Change in Lao PDR (Michael Burger, July 2015). U.S. cities and states are increasingly asking how they can play a more visible and active role in international climate change efforts. Cities and states have obvious incentives to take action to mitigate and adapt to climate change. But why engage internationally? They may seek to demonstrate leadership or gain appropriate recognition for “doing their part.” They may want to inspire others to follow suit or support them in doing so, such as through exchanging best practices. 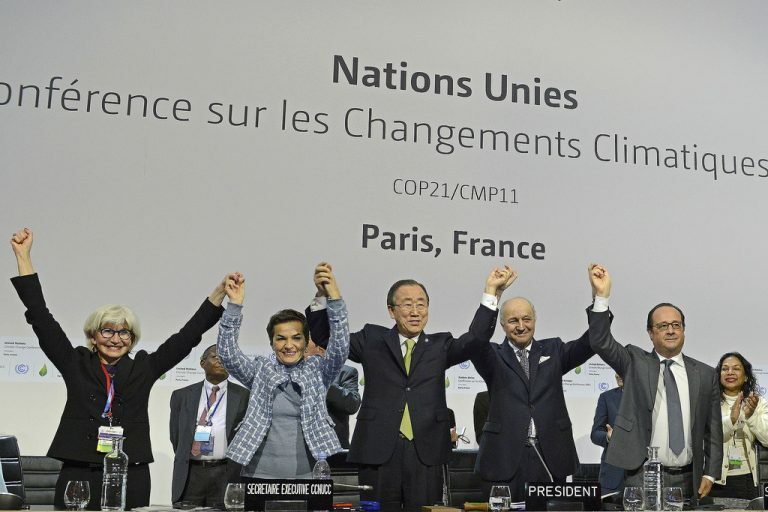 They may seek to join the global march toward low-emission and resilient societies. Or they may want to show the world that U.S. action on climate should not be viewed exclusively through the federal lens, especially given the large percentage of U.S. emissions that are within the jurisdiction of cities and the more populous states. Between the Paris outcome itself and various platforms and processes developed both before and after Paris, U.S. cities and states have several options at their disposal for reflecting climate-related commitments and otherwise engaging internationally. It may also be desirable to strengthen these options and/or create new ones. This paper explores the different ways in which negotiators to three recent environmental instruments accounted for different national circumstances in formulating commitments and other aspects of cooperation in the instruments. The author finds that the negotiators of these instruments have significantly expanded the arsenal of differentiation tools based on considerations pertaining to logic, fairness, limited capacity, and negotiating leverage. This article discusses implications of the the ruling of The Hague District Court in June 2015 forcing the Dutch government to implement a more ambitious mitigation policy in order to comply with its duty of care. This article describes Brazil’s 2009 National Policy for Climate Change (NPCC) and explores how the principle of sustainable development provided for in the Brazilian Federal Constitution can be used to correct omissions and imperfections in the NPCC’s application when NPCC provisions come before the Judiciary branch, the Executive branch and regulatory agencies. This paper compares the approaches that regulators in the United States and European Union have taken to improve energy efficiency in the existing building stock. The measures evaluated are diverse and range from conventional regulatory approaches to innovative market-based instruments. Drawing on the European experience, the article outlines several recommendations for improving the energy efficiency of existing buildings in the United States. Published in Volume 5 of Seattle Journal of Environmental Law. This article analyzes how the TPP’s investor protection provisions and dispute settlement mechanism might be invoked to challenge climate change policy. The author concludes that the negotiators’ efforts to date are insufficient to protect climate measures from the risk of liability, and suggests reforms to the draft text. Published in Volume 45 of Environmental Law Reporter. This paper analyzes 173 cases from the Sabin Center’s Non-U.S. Climate Litigation chart, casting light on the “who, what, why, and how” of non-U.S. climate change litigation and investigating the role of the courts in the development of climate change policy outside of the United States. It represents the first comprehensive survey ever conducted of climate change litigaiton outside of the United States. It finds that there is far more climate litigation in the United States than in the rest of the world combined, and that the country with the second largest number of cases is Australia. The survey also finds that unlike the U.S., which has experienced substantial litigation intended to shape the development of climate regulations, non-U.S. climate-related cases have focused on specific projects and implementation of specific policies. All publications involving international and foreign law are available here. Papers involving international trade and investment are available here. This page contains a compilation of offset protocols from various cap-and-trade programs (created in 2010).